Can you help us add further information? The Southern Provincial Police Orphanage was in Redhill Surrey between 1890 and 1947. Records are patchy but it is thought that the following Gloucestershire Police Families took advantage of the services offered. It appears that children had to be children who had a dead parent who had been a police officer rather than having no living parents. Children may also have attended the orphanage if their parents fell on hard times. Started at the orphanage in January 1897. Their father was the Inspector in the Weights and Measures Department and died from Typhoid on 26th October 1897. 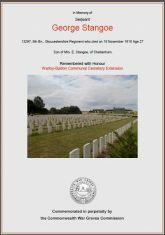 George was killed in The Great War. Went to the orphanage in November 1899. A John Preen is mentioned in the Standing Joint Committee minutes in 1898 as being discharged because of his ill health . Joined the orphanage in December 1909 and April 1910. Their Father was Martin Tom Keyse a popular and well respected Police Officer who died on 5th November 1909. Stanley became a police officer in Gloucestershire Constabulary before joining the Shanghai Police. Headquarters staff in 1920 outside New Court Police Headquarters, Lansdown Rd. Cheltenham. Back Row left to right; Police Constables Crouch, Jotcham, Orderly Keyse, Police Constables Lippett, Wynniatt. 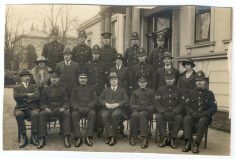 Middle row left to right: Miss Watts, Police Constables Williams, Large, Woman Police Constable Hagley, Police Constables Wakefield, Birchard, Miss Stowell. Seated left to right: Police Sergeant T.A. James, Inspector J Evans, Superintendent J.B. Biggs, Chief Superintendent Cooke, Inspector A. Sainsbury,Police Sergeants J.A. Price, G. Pugh. Started at the Orphanage in February 1925 and might have been the children of ex Police Constable Joseph Bateman who died on 22nd January 1922. Police Constable 317 Joseph Bateman taken outside Iron Acton Police Station about 1905. This page was added on 23/07/2018.